Some Qatari banks are becoming less willing to sell dollars to foreign lenders amid a lingering regional standoff with a Saudi-led alliance, according to people familiar with the matter. Foreign exchange activity between local and international banks is almost at a standstill, the people said, asking not to be identified because the matter is private. The central bank is still providing dollars to local lenders to meet domestic business needs at the pegged rate of 3.64 riyals per dollar, they said. To get dollars to fund imports and other commercial activities for local clients, foreign banks are using the offshore market to buy the U.S. currency at a higher rate and may have to pass these costs on to clients, some of whom are in Qatar, the people said. The Qatari riyal strengthened to 3.6667 versus the dollar in the offshore market on Tuesday after falling as low as 3.80 on Monday, the lowest since 1988, according to data compiled by Bloomberg. Qatari lenders are coming under pressure after Saudi Arabia, the United Arab Emirates, Bahrain and Egypt severed their diplomatic and transport links with the gas-rich state, accusing it of supporting extremist groups, a charge it denies. Banks from these countries are said to have since pulled deposits from Qatar, refused to roll over holdings and stopped any new business with Qatari institutions. State-run Qatar National Bank QPSC, the Middle East’s biggest lender by assets, said in an email the information is “incorrect.” The central bank is providing dollars to local banks “as and when required for all legitimate transactions with an underlying commercial basis.” The bank doesn’t support speculation “by others in the dollar/riyal interbank market,” it said. Central bank officials didn’t immediately respond to requests for comment. Qatari banking shares declined. QNB ended down 0.5 percent after falling as much as 1.1 percent, while Qatar Islamic Bank SAQ retreated as much as 1.6 percent before closing down 0.5 percent. Doha Bank closed 3.4 percent lower. Qatar is capable of supporting its banks with assets in the country’s vast sovereign wealth fund and foreign currency reserves, the central bank governor said on Oct. 5. Stress tests routinely conducted by the central bank show the strength and efficiency of Qatari banks in the face of the “arbitrary measures” imposed by boycotting countries, said Governor Abdullah bin Saoud Al Thani. Qatari banks are seeking to raise funding after authorities told lenders to tap international investors, instead of mainly relying on the government, people aware of the matter said in August. QNB, Commercial Bank QSC and Doha Bank QSC are among lenders said to be considering options that include loans, private placements or bonds. The government too is considering raising at least $9 billion from international bond markets to replenish state coffers, people said earlier this month. 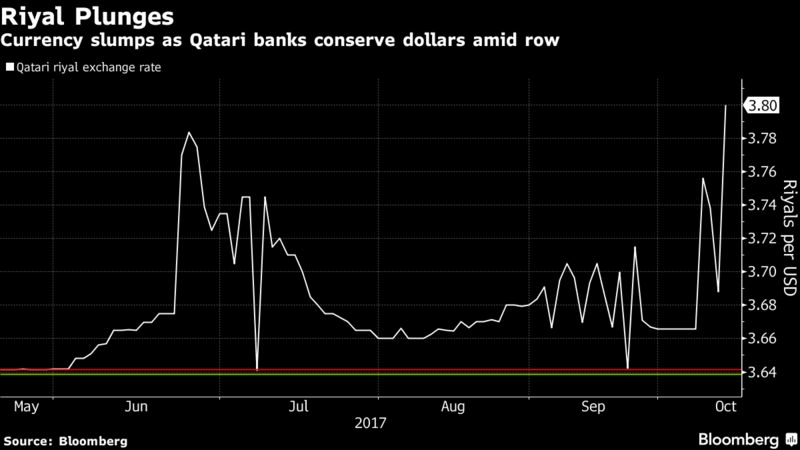 Qatar pumped almost $40 billion to support the economy and financial system in the first two months of the standoff, Moody’s Investors Service said. The Qatar Investment Authority, which has reduced its direct holdings in Credit Suisse Group AG, Rosneft PJSC and Tiffany & Co., is considering selling more of its $320 billion of assets, which includes stakes in Glencore Plc and Barclays Plc, and channeling the proceeds into its home market, people said this month.